This strong wood comb feels great in the hand and glides easily through the hair. Because of being anti-static it won’t leave your hair in a frizz. Handmade from a 100% pearwood. It is made to last and to be the last comb you will ever need. Combing your beard, mustache and hair. Great for applying beard oil, just brush the oil into your beard and mustache using the beard comb. 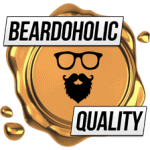 WHY CHOOSE BEARDOHOLIC BEARD COMB? It has great grip and provides outstanding control over your comb. It is a “Comb2Go” and pocket-friendly. Elegant and classy design and comes in a gift box, making it a must-have beard care product and a perfect and ideal gift for any bearded men. Our products are our own originals, made from quality materials only. 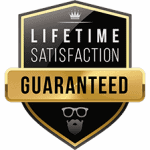 They are some of the best out there, and how much we believe in them, see our guarantee. If you’re unhappy with our products at any time, ever, as long as they’re not broken or emptied, you can return them free of charge. Return is on us. You get a full 30 days money back guarantee. If it doesn't fit, it breaks, you've changed your mind or for no reason whatsoever simply send it back to us and we'll refund you every cent.